George Shields is hoping that his first win as caretaker manager of Montrose proves a good omen after being handed the job on a permanent basis. Shields, who has brought in former Scotland defender Lee Wilkie as his assistant, takes over after Stuart Garden left by "mutual consent". "My last game as caretaker manager was a 2-1 win over Annan," said Shields, who had been Garden's assistant. "And hopefully we can build on that in my first game in charge officially." Garden left as soon as it became impossible for Montrose to qualify for the play-offs and with it their chances of winning promotion from Scotland's League Two. But a win away to East Stirlingshire on Saturday would lift the Gable Endies above their hosts and into sixth spot. Under former Dundee, Arbroath and Forfar Athletic player Shields, Montrose drew away to bottom side Queen's Park and lost to Clyde before that win over second-top Annan. "The players were terrific against Annan and, despite not having anything to play for, they fought for everything," he told the Scottish Professional Football League website. "I am sure the way they went about things impressed the board. It certainly impressed me and I have to thank the players for it. "During my three weeks in charge, I have also had a full turn-out at every training session. The players have backed me and I am really pleased with that." Montrose said in a website statement that they had interviewed others for the post before appointing the former boss of junior side Dundee Violet who had also been head of youth development at Links Park. "George was very impressive in the interview stage against equally strong candidates and the club is positive George, with his management team, will build a a strong team for the coming season and competing for promotion to SPFL League 1," it said. Wilkie will remain with junior side Lochee United, where he is assistant manager, until the end of the season before joining Montrose. The 34-year-old, capped 10 times for his country, played for both Dundee and Dundee United before being forced to retire because of a knee injury in 2010. Wilkie also had loan spells with Plymouth Argyle, Notts County, Falkirk and Ross County. 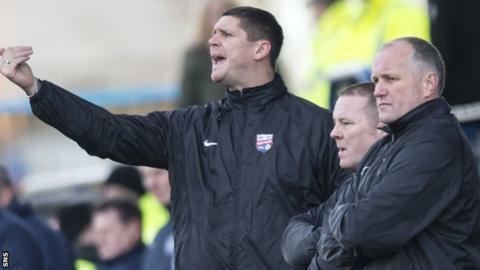 Goakeeping coach John McCafferty completes the management team at Montrose.